From the Women's Nico collection by UGG® Australia the Liilie is a glitter infused suede sandal with criss-cross straps at the vamp and braided ankle strap. Rear zip with tassel for easy entry. 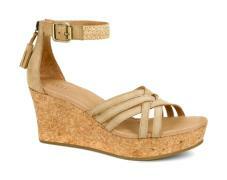 Ilghtweight cork wrapped midsole and plush Poron® foam cushioned leather lined footbed for comfort.